"We now have a compact series with all kinds of colors that are well branched, have large flowers, do not produce seeds and are hardy." Har is proud of his introduction, the Erysistible series is a mix of two types of wallflower, as the Erysimum is also called. "First of all you have this variety", Har walks to the Erysimum linifolium Bowles Mauve. “This species only has one color, mauve. It blooms in April and continues to bloom until October. For perennials that is very unique, flowering all summer is great.” Har crossed the Bowles Mauve with the normal wallflower, an Erysimum cheirrii. "This wallflower is a biennial plant and comes in many colors, but only blooms for four weeks." As a result, Har is able to introduce the Erysimum series in four colors: Yellow, Sunset, Tricolor and Magenta. “They are much harder than the parents. We test them all the way in Utah, USA, where it is guaranteed to freeze 20 degrees for a few weeks," says Har. “They start flowering in April and in an exception it stops flowering in the summer when it is really too hot, but then it continues again in the fall. For me it is really a summer plant." The new Erysimum Erysistible series is shown at Syngenta's Spring Trials in 2019, together with more new novelties. 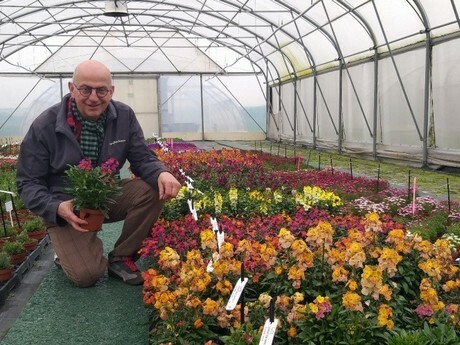 You can visit the Spring Trials in Andijk, the Netherlands during 29-04-2019 – 10-05-2019. Contact your Sales Representative for more information.